In September 2013, I was recruited by then-principal Eric Sheninger to be the new library media specialist of New Milford (New Jersey) High School, and was tasked with seeking to improve student performance by developing an exciting and engaging learning environment for all. My vision was of a learner-centered space where students and teachers would have access to exciting technologies, digital and print resources, and productive spaces offering scope for collaboration and creativity. In seeking to turn what been a largely unvisited and unused library into a vibrant part of the school community, I felt challenged by the limitations of the physical space. The library had not been renovated in decades, and it offered very little in terms of what a modern-day learning "commons" should be. My inspiration at this point was Pixar Animation Studios. I'd read that Pixar had set itself on the path of being a constant learning organization, and I remembered that part of the impetus behind their mission had been attributed to their flexible, creative, and collaborative office spaces. I combined the ideas that I garnered from Pixar's quest with a quote from Winston Churchill that I have always liked: "We shape our buildings, thereafter they shape us." Bringing Churchill's maxim into the digital age, I decided to try broadening the concept of a "building" by extending the physical attributes into a virtual space that we could shape to contribute to learning success in the school. So Pixar, Churchill, and the needs of the school community all helped me lay out a blueprint for transforming our library into a constant learning organization -- by creating a virtual campus for New Milford High School. Many virtual learning solutions exist in the market. Their uses are varied, and most need to be customized and personalized for different needs and contexts. I formed a partnership with Proton Media, a company that provides a solution called Protosphere. 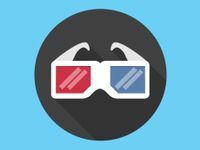 This is a 3D virtual environment that enables organizations to deliver online, instructor-led training programs and to foster immersive virtual collaboration. Given that it was intended primarily for corporate and enterprise use, we had to think very carefully about how to recast it into a 3D virtual learning environment suitable for our school. I envisioned shaping it to allow us to explore how 21st century libraries can use the virtual terrain for creating fluid, flexible learning spaces. We designed our virtual space to include five rooms: a theater, a hall, large meeting rooms, and different learning spaces. Protosphere has enabled us to explore and experiment with different pedagogies in a virtual environment. Additional inspiration for this idea came from Sugata Mitra’s TED talks on how students can teach themselves and building a school in the cloud. The cloud allows for both synchronous and asynchronous learning, attributes that we utilized in NMHS. And since content and materials are available at all times, this allows students to come into the environment outside of class time. 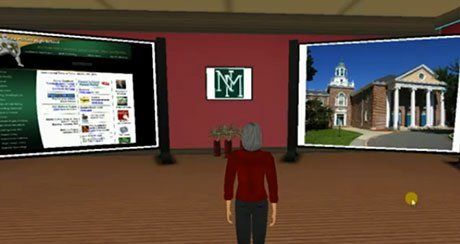 A pilot group of teachers and students explored how to communicate and collaborate in a virtual environment through interacting via avatars. The virtual space proved much more participatory than the regular physical classroom. For example, we were able to design experiences for the avatars to get up and move around as much as possible. Our learners were able to talk, view, and interact with presentation and media content, record notes, and access the web, all at the same time, from anywhere. We were able to embed learning into collaborative processes to improve performance and extend the learning culture beyond the usual constraints of the physical classroom. We also felt that we were helping to prepare students for the 21st century labor force in which many of them will have to work, communicate, and collaborate virtually -- something I refer to as cloud literacy. CBS News thought the project interesting enough to broadcast a story called "New Milford High School Gets 3-D Virtual Classrooms" (see the video below). The piece gave the students' perspectives on the experience of breaking down the barriers of a traditional classroom. It also showed how the role of the teacher shifts to facilitator of knowledge acquisition, a role that is critical in a virtual classroom, although the teacher still has to design and deliver the structure needed for a successful lesson. The clip also showed that the learners themselves can become facilitators in the virtual environment. Immersive environments are a viable option for learning. Thanks to our virtual learning environment, we were able to have an always-open library where teachers, students, data, and content came together to increase the speed, richness, and effectiveness of knowledge creation and transfer. We were able to overcome collaboration barriers that so many students face in the physical world, allowing our students to work on group projects any time or place. Classrooms in the cloud present us with a universe of limitless knowledge and boundless possibilities that we all should embrace.